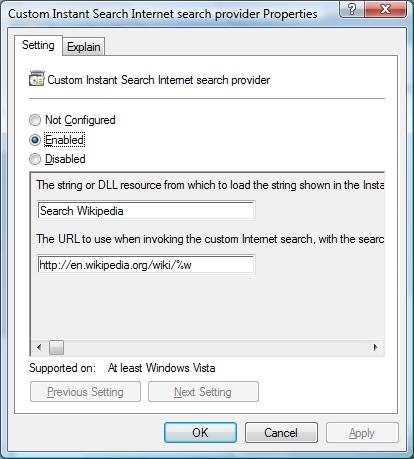 If you spend a lot of time in searching useful information in Wikipedia, Google or Yahoo, instead of going to Wikipedia or Google or Yahoo homepage itself to type the keyword and perform the searching, you actually can add search Wikipedia, Google, Yahoo option to Windows Vista Start Menu Instant Search Box so that you can type the keyword from the search box and choose to search in either Wikipedia, Google or Yahoo websites. 1. Click on Start button, then type gpedit.msc in the search bar, then hit enter key. 2. User Account Control is displayed and click Continue button to proceed launching Local Group Policy Editor. 3. Navigate to User Configuration > Administrative Templates > Windows Components > Instant Search > Custom Instant Search Internet search provider, click on Properties to open the properties window. 4. Under Setting tab, select Enable to enable the policy setting. 5. At “the string or DLL resource” text box, type either Search Wikipedia, Search Google or Search Yahoo. 6. At “the URL to use when invoking the custom internet search” text box, key in either one of the URL. 7. Click OK button to save the setting. In order to take the effect of the group policy changes, you must either reboot your computer or type gpupdate/force at command prompt then hit enter to execute the GPO update immediately. If you choose to enable Search Wikipedia, you will see Search Wikipedia appears at Start Menu Instant Search Box once you have started to type at the search box.